Little House on the Blanco @ Shade Ranch (http://www.shaderanch.com) is a stone Hill Country Vacation house nestled along the Blanco River among the mighty oaks of the Hill Country. Drive down a tree-lined one-lane road and begin enjoying the beautiful, tree covered 25 acres offering tranquility and seclusion. Walk less than 100 yards from the house to take the stone steps to the river below. 513 feet of private river access awaits you with a deep swimming hole in both normal and drought years. Take a swim in the clear blue waters of the Blanco River. Enjoy a picnic or a nap or a book along its banks. Dine in the covered porch watching the deer graze and maybe see the rare violet-ear hummingbirds that have been known to visit. Get cozy on those cold nights in front of a warm fire from the beautiful rock fireplace in the living room. You will find a wonderful, large outdoor hot tub right off the covered porch. It is a private place to unwind while admiring the brilliant stars above and the quiet solitude of Shade Ranch. Little House on the Blanco @ Shade Ranch has so much to offer with its 25 peaceful acres, private river access, a fully equipped kitchen, open dining areas inside or on the covered porch (with Weber propane grill), and a large bedroom with a queen size comfortable bed. There is also a great stone fire pit with stone benches, perfect for roasting marshmallows or warming up on a cool Hill Country evening. Located only 5 minutes from Wimberley Square, this home completes the perfect hill-country getaway without sacrificing any of the charm (or shopping opportunities) that Wimberley has to offer. And with high-speed/wireless Internet and satellite TV, you won't sacrifice the conveniences of modern technology, either. There is also a larger 3 bedroom house on the same property. The houses are completely separate and don't share anything other than the acreage. The houses sit approximately 100 yards apart and have a bank of cedar trees and a large cedar privacy fence that sit between the houses and create separate areas for privacy. The Texas Hill Country style vacation houses can be rented together or separately depending on the size of your group. We always stress to our guests that our home is mean to be enjoyed in a relaxed manner and we don't want a party atmosphere. Wimberley has a wealth of activities to enjoy for couples and families alike while you're in the Texas Hill Country. Enjoy the Texas Hill Country outdoors by visiting the local state parks and water holes such as Pedernales Falls State Park, Hamilton Pool, the Blue Hole, Canyon Lake, Lake Travis, tubing at the Guadalupe River, Jacobs Well and of course our own Blanco River in our backyard. Rent a boat at Canyon Lake from the Canyon Lake Marina or do the same at Lake Travis. Go on a wine tour at Driftwood Estate Winery, Duchman Family Vineyards, Texas Hills Vineyards and Wimberley Valley Winery with a stop at Bella Vista Olive Orchard to try olive oil and their own wine. Enjoy great restaurants like The Leaning Pear, The Salt Lick BBQ, Marco's Italian, Brewster's Pizza and Brewpub, Kate's Place, Linda's Fine Foods, Jobell Cafe & Bistro, The Back Porch, Hays City Grill and many others. Extend your drive and do some of the Texas BBQ Trail by visiting Luling, Lockhart and Llano where world famous BBQ can be enjoyed. There are no shortage of shopping opportunities at the Wimberley Square where you can find plenty of Hill Country crafts, furniture, textiles, plenty of art and many other treasures. Drive 20 minutes to the San Marcos Premium outlets and, of course, during Wimberley Market Days March through December you can find lots of unique items 10 minutes away from Shade Ranch. Or hit the Hill Country Trail on the road to travel along The Devil's Backbone to take in awesome views of the Texas Hill Country on your way to the town of Blanco. Try some brews at the Real Ale Brewery when you arrive and enjoy a free tour. Visit Gruene, Texas and the famous Gruene Hall to see the oldest dance hall in Texas. Enjoy concerts at Gruene Hall on weekend nights or enjoy a casual atmosphere on Saturday and Sunday afternoons when free music can be enjoyed over a cold Texas beer. Lots of great towns can be visited using Wimberley as your home base; Blanco (19 miles away), Buda (17 miles away), Driftwood (17 miles away), Dripping Springs (16 miles away), Gruene (20 miles away), Kyle (22 miles away), San Marcos (15 miles away), Austin (45 miles away), San Antonio (60 miles away), New Braunfels (27 miles away) and Fredericksburg (50 miles away). The Norvell family hails from Houston, TX where we, like most Americans, lead over-booked lives full of schoolwork, school activities, sports, civic, and work responsibilities. We enjoyed a most relaxing vacation at Shade Ranch in 2008. In fact, we loved it so much that we purchased it three months later. Our kids are young and our parents and family do not live nearby. We wanted a place for our extended family to get together to run, swim, climb, spend time as a family, and just enjoy the beauty of nature. We hope your family enjoys Shade Ranch as much as we do. Shade Ranch in Wimberley Texas is a perfect location for us because it is 3 hours from Houston door to door and only 1 hour from the Austin or San Antonio airport. Our parents and extended family and friends often join us for vacations at Shade Ranch. We love the Little House and speak regularly of leaving the kids in Houston and enjoying a weekend there ourselves. With sleeping room for five we have plenty of room for our 3 kids or it's perfectly intimate for just a couple. We appreciate the seclusion of the 25 acres while making full use of the conveniences of the Village of Wimberley. We regularly utilize the nearby groceries, pharmacies, restaurants, wineries, hardware and other stores. We appreciate the many nearby state parks and towns that make up the Texas Hill Country! The most obvious benefit of Shade Ranch is the beautiful, cold and clear Blanco River. One swim and you too will be sold as it is cool even in the dog days of August, and never crowded. The shallow area suits those wanting to wade or to sit and enjoy the flow of the river and also serves as entry to the adjacent deep swimming area. We think it is perfect and the kids do too. They and their cousins and friends can't get enough of the river when we are there. The river bank area is so spacious, and the sound of the river is so peaceful, it is our favorite place to picnic or enjoy a glass of wine. The kids also like to play games and sports in the grass along the river. They also enjoy fishing, climbing to the 'cave' by the river under the ledge, looking for arrowheads after a rain, having a family 'sleepover', and just exploring the 25 acres of 'forest'. We know you will find these wonders and more at Shade Ranch. Full bathroom with shower. Bathroom includes soap, body wash, shampoo and hair dryer. While we're in the Wimberley city limits, you feel that you're in the country with large acreage, deer, foxes, birds and our own cows. We are 1.5 miles from the Wimberley town square along with its great shops, restaurants and parks to enjoy. We are on the spring fed Texas Hill Country Blanco River. We own 513 feet of riverfront that only our guests can use. Bring kayaks, canoes, fishing poles and other water toys to enjoy your time. 513 ft of Private Blanco Riverfront with deep 4+ ft deep swimming hole. We have two stone patios with steps into the river as well as many easy access points. Long distance calls can be made with calling card. Full air conditioning provided and guests can control the thermostat. Full healing is provided and guess can control the thermostat. 300+ thread count sheets are provided for both beds and air mattresses. Blankets and extra pillows are provided on the bed and/or in the closet. Stone wood burning fireplace is located in the living room. Space available for 2 cars if needed. Wifi and ethernet cable connections available. Bath towels, hand towels and wash cloths provided. Please bring along river towels for use at the river. Modem located on the desk next to the kitchen area. Regular leather sofa, leather love seat, coffee table, side tables and lamps and TV with DirecTV cable. Full sized refrigerator and freezer. Large pot coffee maker provided as well as Folgers coffee, creamer and sugar. Basic spices, ziploc bags, Pam spray, coffee, sugar, etc. provided so that all you need to bring your food and more specialized spices. All plates, bowls, glasses, utensils, pots, pans, cookie sheets, etc. provided. Fully stocked kitchen with dishes, glasses, utensils, etc. We also provide filtered water through a separate spout next to the kitchen sink. Dining area next to kitchen and positioned to look out on patio and outdoor grounds. Large wooden table wish 6 chairs provided with plenty of space for a family of 5. Flat screen TV with DirecTV. Music player with CD and Bluetooth connection is available. Books for both adults and children are provided. Basic stash of children's toys provided for their enjoyment. Various DVD's of Box Office Hits provided in the cabinet underneath the TV. Feel free to bring along a kayak or canoe to explore the river. Covered patio with table and chairs and outdoor string lights. We provide water toys such as tubes, noodles and rafts. Our supply comes and goes based on what guests leave behind or take with them. Quick Sand Golf Course is located within 15 minutes of the property. Outdoor hot tub next to patio and house. Hot tub is treated twice/week. House is well maintained and has a number of Latin American art pieces throughout the house. Located on private 25 acres with private riverfront. A picnic table located along the bluff overlooking river. A stone fire pit and stone benches are just outside of the house for guest use.. We provide sheets, towels, shampoo, liquid soap, paper products, hair dryer and all kitchen dishes and utensils. We stayed in the little house at Shade Ranch. It had everything you could want and more. The house was very clean, the linens and bed were top notch and the kitchen was well stocked. We enjoyed the fire pit, the horseshoe game and the river most of all. Just a great, private piece of the river. Lots of deer on the property too. Would love to go back. Loved our stay at Little House on the Blanco. It was such a peaceful spot it was hard to believe that it was so close to restaurants, HEB and everything we needed in Wimberley. Hope to make a return trip soon for a longer stay. We love our stay! 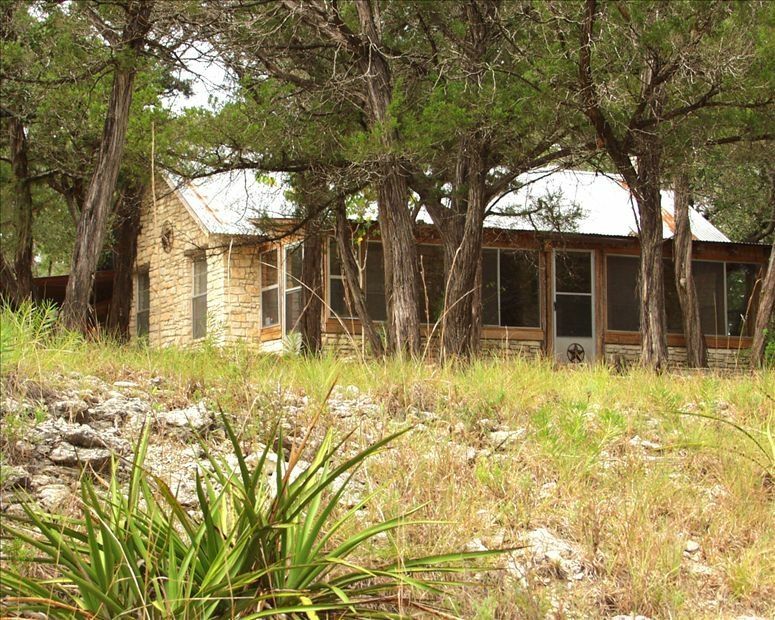 The house, the river, fishing, spa - so comfortable and conveniently close to Wimberley! We had everything we needed for a wonderful relaxing and most importantly quiet weekend. Very comfortable beds, hot tub ready to go, fire pit, horseshoes! Hosts answered questions promptly and provided everything needed! This place is just minutes from Wimberley town center, but you would not know it sitting on the porch or the hot tub. The cabin is about 100 yards from another rental on the same 25 acres; it was unoccupied for the five nites we were there. It would not have been nearly so private had there been a party next door, as the big house can hold 10-12 guests. The cabin itself is a delight-it seems bigger than the stated size. We used the fireplace twice, and the host did a good job keeping wood available. There is not a dishwasher or laundry setup as cabin is on septic, but the kitchen has all one needs to prepare any meal. The propane grill was flawless and the hot tub was clean and odor free. We filled the cabin with smoke before finding the instructions for the fireplace/damper in the drawer of the desk. It looks as though these had been by the fireplace, and I would suggest that they go back near it. Because it was winter, we did not go in the water, but the waterfront along the Blanco is as advertised and would be great in summer. With a larger group, both properties could be rented together for completely private experience. Thank you Greg for your nice review. We enjoyed having you. The fireplace flue instructions are normally on the fireplace mantel, but sounds like they got moved. We'll make sure they're where they need to be. For other guests, as mentioned in our listing, we do have a second house on the property. It has a max guest count of 10 but averages around 8 when occupied. The two houses don't share anything other than the land itself and we have a no party policy. There is a bank of cedar trees, a wood shed and a cedar privacy fence in between the two houses that provide added privacy. In addition, the Little House's patio and hot tub face our wooded forest in the opposite direction. Shade Ranch is located just south of the Wimberley, TX town center on 513 feet of Blanco River Frontage. Wimberley sits 45 minutes southwest of Austin, TX and 45 minutes northwest of San Antonio. Go boating and water skiing at Canyon Lake (20 mins) or at Lake Travis (40 mins). Shopping: Shop to your hearts delight at the Wimberley Square by wandering through the shops which is a favorite activity of visitors and locals like. Travel 20 minutes to the San Marcos outlet shops and visit almost 150 different shops. Or schedule your stay to coincide with the famous Wimberley Market Days (April thru December) to find unique Hill Country crafts, furniture, artwork, textiles and more. Visit Key State and County Parks all within an hour of our home: Hamilton Pool, Pedernales Falls State Park, Jacobs Well Natural Area, Blanco State Park, Natural Bridge Caverns and the Natural Bridge Wildlife Park. Do a Hill Country Wine Tour: Duchman Family Vineyards, Driftwood Estate Winery, Wimberley Valley Winery, Texas Hills Vineyards and many others near and around Fredericksburg. Finish it off with some tasty Hill Country BBQ at the Salt Lick BBQ in Driftwood. Enjoy the music scene by visiting Gruene Hall (20 mins away) or the famous Lukenbach, Texas on any weekend to catch live music. There are also special music events in Austin (Austin City Limits, etc.) or even in the town of Fischer. Hit the Road: Travel along the Devil's Backbone on Highway 32 to take in the incredible Texas Hill Country views. Visit the various towns in the area like Blanco (19 miles from our home), Buda (17 miles away), Canyon Lake (15 miles away), Driftwood (17 miles away), Dripping Springs (16 miles away), Gruene (20 miles away), Kyle (22 miles away), San Marcos (15 miles away) and even New Braunfels (27 miles away), San Antonio (45 miles away) or Austin (45 miles away). All rates include maximum of 5 guests. Pets: Sorry, no pets allowed. Cancellation Policy: Please note that VRBO/HomeAway system uses a boiler plate refund policy. Our policy is that you receive a full refund, less a $75 re-booking fee, if you cancel more than 30 days in advance. If you cancel less than 30 days before your arrival date, you will be refunded (less the $100 re-booking fee) if we are able to re-book the same dates as your stay. This policy overrides the HomeAway stated policy. Damage Deposit: Your damage deposit will be refunded one week after your departure if the following conditions are met: 1) no damages are made to the property, house or furniture; 2) the house is left in an orderly fashion and not in need of additional cleaning due to excessive trash or messes; and 3) neighbors or guests at the other house were not disturbed during your stay where complaints were made. We will not hold your deposit hostage, we just want people to be considerate guests.